The final chapter in Mischa Honeck’s 2011 work, We Are the Revolutionists: German-Speaking Immigrants and American Abolitionists after 1848 is titled, “A Revolution Half Accomplished: Building Nations, Forgetting Emancipation” (Athens & London: The University of Georgia Press, 2011). 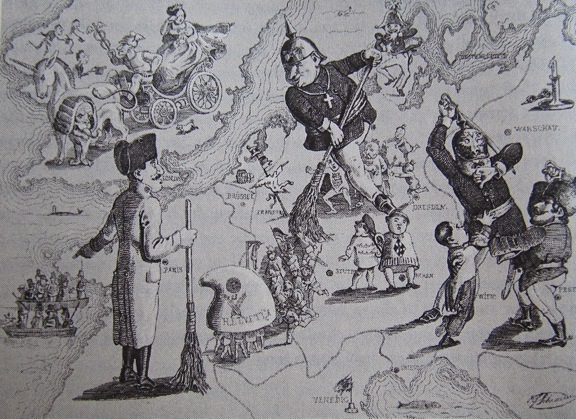 To capture the opening point of this chapter title, a Thomas Nast cartoon illustration is included from a November 20, 1869 issue of Harper’s Weekly, “Uncle Sam’s Thanksgiving Dinner.” The illustration shows a global thanksgiving table with a “Universal Suffrage” centerpiece. Surrounding the table are representative cartoons from a variety of ethnicities, including African-American, Chinese, Russian, Native America, and so on. This cartoon does not capture the realities of U.S. policy toward Native America at that time, but it does reflect Nast’s personal ideals. This tension between the ideal (or the way things ought to be) and reality (the way things are) is a crucial element to setting down a good piece of history, and in this vein Honeck delivers. During the American Civil War, Anglo-America battled with one-another over abolition and that “peculiar institution.” This struggle between brothers and cousins is captured by the ever-growing and all-important industry that is Civil War historiography, nostalgic Ken Burns documentaries notwithstanding. If wanting to think about the Civil War in the context of the Atlantic World, or in the context of Global or World History, however, Honeck is where to find it. Numerous immigrants arrived to the United States in the years preceding the Civil War, and Honeck’s history focuses on the German element. A German lithograph from 1849 depicting the Aristocratic crackdown on the democratic revolutionaries of 1848. Note the coast of western France, and the two boats loaded with Europeans preparing to cross the Atlantic. Europe, street fighting was the norm. In order to escape this street fighting and the Aristocratic reaction to the democratic requests, individual Germans started chain migrations, or emigrations out of Germany and into the United States. By the 1850s numerous pockets of German-Americans had began settling the Great Plains, including liberal German thinkers and the North American Turnerbund throughout the continent (New Ulm, Minnesota is an example of a free-thinking Turner Society settlement). There is a paradox with the arrival of German-American idealists to settle in territories and states throughout the Great Plains, though, and Honeck only hints at it (in his defense, though, his study is mainly concerned with the eastern 3/8s of the United States and the Atlantic World). That paradox is this: while German-Americans carried with them democratic ideals, their physical settlement on the Great Plains invariably contributed to the protracted displacement of indigenous populations. Nonetheless, many German-Americans became part of the Union Army fighting force during the Civil War. Honeck references the words of the radical Eduard Schläger who in 1871 noted how German-Americans had abandoned those — ahem — silly notions of egalitarianism and gained, “…a growing respect for ‘Anglo-American business methods,’ particularly the disagreeable ones, such as ‘the greed for the dollar. '” Schläger was particularly grumpy, in part because he felt philosophical foundations were being undermined once a little or a lot of money was put on the table. Honeck concludes with how German-America appropriated ideas of industrial capitalism, and this is a ground-level view of how Max Weber’s nineteenth- and twentieth-century industrial capitalism eclipsed Adam Smith’s eighteenth-century notions of moral sentiments, empathy, sympathy, and compassion. We are well aware what happened throughout the Minnesota River Valley in August of 1862, from Fort Abercrombie, Dakota Territory to New Ulm, Minnesota and everywhere in between and on the periphery (including Mankato, Minnesota, the site of the largest mass execution in United States history). Native America would indeed feel the brunt and shock-wave of this industrial capitalism throughout the Great Plains, and there is definitely more work for historians and archaeologists to carry out. In this way much of the past has yet to be considered and written. Honeck’s concluding chapter is an excellent starting point to push scholarship in needed directions, at least as it concerns how Anglo- and German-American ideals gave way to the nation-making processes within the continental interior during and following the American Civil War. This entry was posted on Thursday, November 1st, 2012 at 2:53 pm	and tagged with Civil War, Dakota Territory, Fort Abercrombie, German-Americans, Germany, Great Plains and posted in Uncategorized. You can follow any responses to this entry through the RSS 2.0 feed.